How rich (or not) is your community? Massachusetts ranks in the top tier nationally when it comes to median household income, but within the state itself there is a vast range in earnings, new figures from the US Census Bureau show. Median household incomes range from $31,406 on the tiny island community of Gosnold to as high as $201,200 in the Boston suburb of Weston, according to the Census’s most recent five-year American Community Survey, conducted between 2010 and 2014. The American Community Survey’s definition of income includes most common types of income, such as wages, salaries, interest, and dividends. But there are certain exceptions, including capital gains, gifts, and lump sum inheritances. The national median household income is $53,482, and it is $67,846 in Massachusetts. Only 50 Massachusetts communities were below the national median; meanwhile, 48 had median incomes that were more than double the national figure. Most of the higher-income communities are Boston suburbs. The median income in the city of Boston is $54,485, below the state median. Melnik said that while Boston has a sizeable number of wealthy families, it also has a large number of low-income residents. The city is also popular among people in their early- to mid-20s, who tend to have lower wages because they are starting their careers. Then, as those young working professionals grow older, many move to the suburbs to raise families, Melnik said. “It’s that cycle of people who are approaching middle age, have established their careers, and are making more money, and say, ‘To the suburbs we go,’ ” Melnik said. Communities in the bottom fifth of incomes are generally located in the western part of the state, though there are several exceptions in central and eastern Massachusetts and on Cape Cod. “Part of it is the cost of living is lower in those communities,” Melnik said. “But some of these are also places that have historically had weaker economies,” he said, citing examples like Holyoke, Springfield, Chelsea, and Fall River. The group of cities and towns with the lowest incomes are “a mix of more rural communities and urban areas where you have a more significant mix of incomes,” he said. For this map, towns and cities were ranked by median income per household and separated into five equal groups, or quintiles, each of which were labeled with a different color. The data is from the US Census Bureau's American Community Survey. The statewide median household income was $67,846. 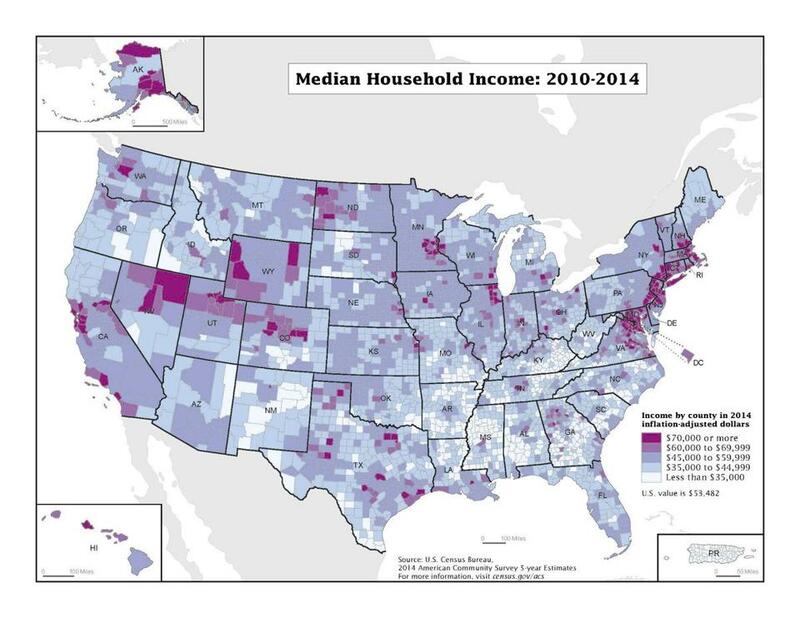 Residents in only six states and Washington, D.C., reported higher median household incomes than Massachusetts, according to 2010-2014 ACS data.